The novel: “The Tales of Amergin - Sea Druid, The Journey Beyond The Veil” by Peter Green has been published by Mirador Publishing. Please go to “Publications” for a synopsis. The novel is available in paperback and e book format with Amazon and can be ordered through bookshops. The new edition of the publication:”A Celebration of the Dingle Peninsula - Corca Dhuibhne” by Peter Green has been reprinted and published by Celtic Horizons Publishing. The book is in Irish and English, editorial and photography by Peter Green, and celebrates the natural beauty, history and heritage of the Dingle Peninsula with the evocative poetry of local poets and inspirational photography. This publication is available from bookshops in Kerry and available directly from Peter Green at Celtic Horizons Publishing. Please go to "Publications" to see a sample cover. Price: 15 Euros plus post and packing. See below for payment method and delivery arrangements. Samples of publications designed and printed by Celtic Horizons Publishing are also provided on the “Publications” menu. 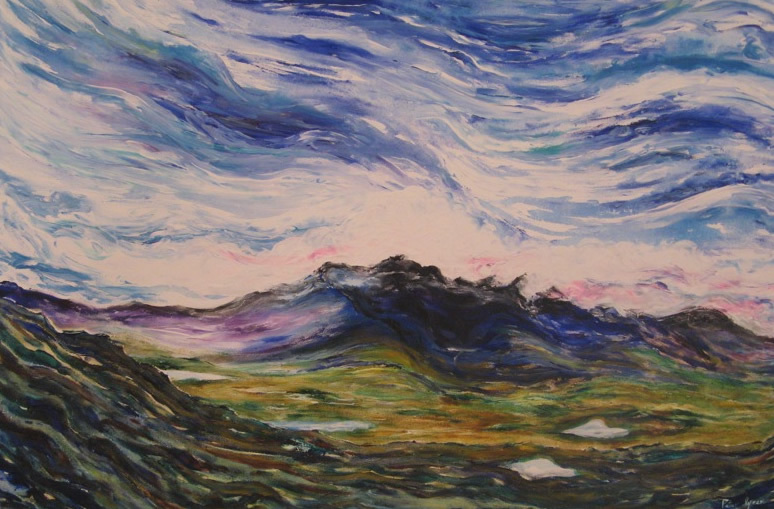 "The Ocean" art exhibition is now open at The Adh Gallery and Cafe, Dykegate Lane, Dingle, County Kerry. Please go to the "Art Gallery" for paintings by Peter Green from the latest exhibition “The Ocean”. A range of work in all mediums is also available on the gallery. A contribution from sales from "The Ocean" art exhibition will go to support the marine conservation and marine and coastal protection areas of Ireland initiative. All the paintings are for sale. Commissions are welcome. Only the best quality artists' materials are used. Please see below for the fully secure payment method with Paypal. Insurance and secure delivery arrangements are provided. Please go to the "Photographic Gallery" for the "Celebration of the Kingdom and Islands of Kerry" photographic exhibition. All the images are for sale in various formats. An extensive library of photographs from Ireland, Wales, Scotland and Cornwall is also available. All images are for sale. Please see the fully secure payment method with Paypal detailed below. Only the highest quality photographic materials are used. Secure delivery and insurance are provided. The Marine and Coastal Protection Areas of Ireland Initiative aims to create a network of marine conservation zones in Irish waters and coastal areas with support for sustainable employment programmes for coastal communities. Please see ”MCPAIreland” for further information. Peter Green is a passionate marine conservationist and a qualified Marine Mammal Observer and has considerable business development expertise and marine conservation background. MCPAI is gathering momentum and support and relies on sponsorship to promote and develop the initiative. "Atlantic Ireland Arts and Adventure" provides a personalised artistic experience, combining artistic , creative and adventure activities with a holistic, personalised approach. Please contact Peter Green directly to book if you are interested. Please go to “Art and photography” for details. The programmes are currently being finalised and places will be limited. Celtic Horizons offers a personal and business development service with a creative ethos. Please go to “Personal and Business Development” for further information. The Activity/Business/Creativity Personal Development Programme is now available for groups and individuals. 1). Go to the art gallery or photographic gallery and identify the number and title of the work of your choice. 2). Send an Email with details of the chosen art or photography, publication or service from Celtic Horizons and your address and personal details. 3). A Paypal invoice will be sent to you by return, with details of price, delivery and service. 4). Once payment is received the selected art or photography will be delivered to your address, tracking and insurance provided. Payment is fully secure with Paypal and can be made using all authorised credit or debit cards. “THE TALES OF AMERGIN - SEA DRUID, THE JOURNEY BEYOND THE VEIL”.